Electricity, often taken for granted, is extremely volatile—one overheated wire or surge can end in disaster. A circuit breaker is designed to prevent trouble. It is an automatic circuit protection system that monitors the circuit it is connected to. Should there be an overload, the breaker will “trip”, or instantly shut off the affected circuit. Here is an overview of how a circuit breaker functions. In a typical circuit breaker, electricity flows through a mechanical switch. There is an electromagnet attached to that switch. When the flow of electricity is strong enough, the electromagnet pulls down on a lever. The breaker then cuts the flow of electricity to the circuit. Unlike fuses, which must be replaced every time they blow, circuit breakers can be switched back to restore power. First, the issue that caused the breaker in question to trip must be addressed. The breaker won’t click back if the circuit is still overloaded. If you have multiple devices plugged into a single outlet, such as a television, vacuum cleaner, and power tools, some of them will have to be disconnected or plugged into a different circuit. There are many branch circuit breakers in your electrical panel, arranged in vertical rows. Each breaker is connected to one or two of the hot buss bars inside the panel. The hot buss bars receive power from the main breaker, which in turn is connected to the two main 120-volt service wires. Breakers for 120-volt circuits typically connect to one buss bar. Those for 240-volt circuits connect to both. Each circuit breaker is wired to its own circuit serving specific rooms or appliances in your home. 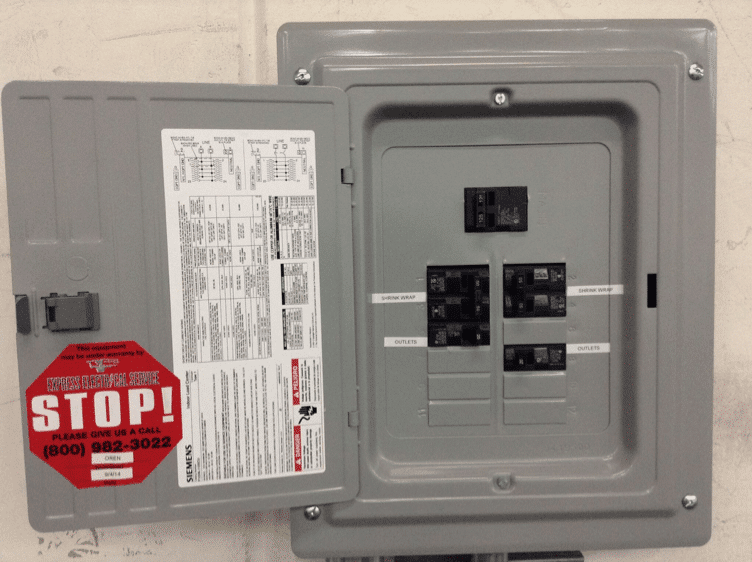 Your electrical panel also has a larger main breaker switch. It can be used to disconnect power to your entire house, just at the flick of a switch. It too can automatically shut off power if electrical demand exceeds design parameters or there’s a problem in your electrical system. Resetting circuit breakers is easy, but when they don’t reset or have worn out, immediate electrical repairs are needed. How Do I Manually Shut Off the Power? You can cut power to any one circuit by locating its corresponding breaker and pulling the switch. To shut off main power, first shut off each branch circuit breaker in the panel, and then flip the main breaker to its OFF position. Once an issue has been resolved or fixed, reset the main breaker by switching it back to the ON position and, to avoid overloading the main breaker, turn on each branch circuit breaker one at a time. Are All Circuit Breakers the Same? Simple domestic circuit breakers: Prevent damage to home wiring by cutting power to overloaded circuits. Ground fault circuit breakers (GFI): Prevent shocks caused by ground faults, which may occur when electricity contacts water. Commercial circuit breakers: Used with extremely high voltage circuits, these have circuitry to adhere to per pre-defined safety criteria. Express Electrical Services is the best electrician in Los Angeles, Orange County, and Riverside County to call when your circuit breakers trip, there’s an electrical panel problem, or you need a GFI installed. We have kept Southern California homes and families safe since 1982. Available 24/7 for emergencies, we can be reached at 855-590-8785 in Los Angeles, 714-406-1322 in Orange County, and 951-234-7310 in the Inland Empire.